The Guild meets every Monday night from 7:00 PM to 10:00 PM and on Sunday afternoons from 1:00 PM to 4:00 PM at Kinder Farm Park in Millersville Maryland, USA. Annual dues for regular club members are $45 payable to the Treasurer in January of each year. 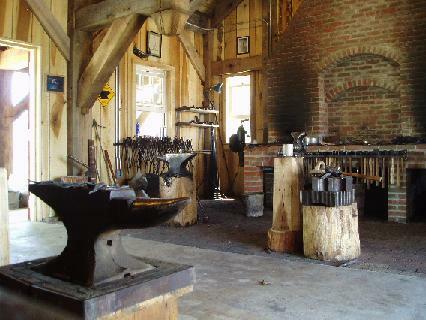 Dues cover use of the club tools and the forge at Kinder Farm Park. They also pay for coal and our insurance. Metal is provided by the guild for small projects. Want to learn the trade? Sign up for our forge safety class. Enrollment includes guild membership for the year! We normally hold a class on the Saturday before Thanksgiving, and then one each in January, February, and March. Each class is four students. People start signing up in late August and classes are usually full by the end of December. Click here for info on joining the guild! Chesapeake Forge is a non-profit entity.